In 1943, Hartvig “Hart” Holmberg opened a carpentry shop in St. Paul, Minnesota, specializing in designing and manufacturing customized cribbage boards, chess sets and wood or metal card games. Word of Hartvig’s ability to create fine crafted goods quickly spread. Soon, the shop began to take on custom jobs using a variety of commercial manufacturing techniques, primarily custom painting and sheet metal work. This work led to fabricating runners for Ski-Doo snowmobiles. Hartvig’s brother Harry worked as a ski engineer and designer for Gregg Skis in St. Paul. Knowing that the addition of a seamless metal edge would revolutionize ski design, Harry called upon Hartvig’s manufacturing skills and together they began working on a prototype. After three years of creating and refining, Hartvig, Harry and friend Ed Bjork were ready. In 1955, the first “Hart” metal-edged ski was introduced. By the mid-1960s, Hart Skis dominated the ski market with an overwhelming U.S. market share and global brand recognition. At its peak in the late 1960s, Hart shipped 144,000 pairs of skis a year, achieving revenues in the tens of millions. 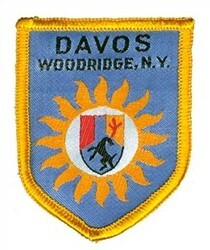 It also was during the 1960s that freestyle skiing became a global phenomenon. 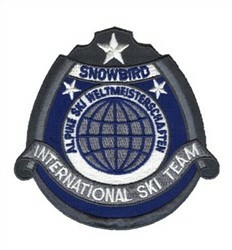 Iron on or sew this fun patch to your jacket, cap, backpack or other items, or give it as a great gift to skier friends!